American ISIS hostage killed? ISIS says woman died in airstrike. 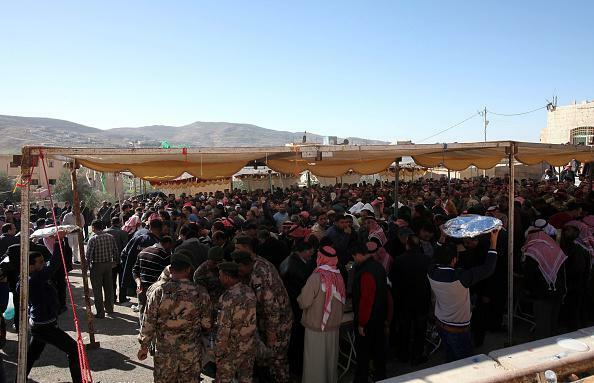 A gathering of mourners for Moaz al-Kasasbeh, the Jordanian pilot burned alive by ISIS in a propaganda video. An Islamic State message published by the SITE Intelligence Group, which tracks jihadist activity, said the American woman was killed when the building where she was being held in the Raqqa area collapsed in an airstrike … The woman, the only remaining American hostage held by the Islamic State, disappeared in August of last year after she drove into Aleppo with her Syrian boyfriend. Her colleagues received a proof-of-life video a few months later, showing her wearing a hijab and begging for her life. The woman’s capture was reported last August, when news reports identified her as a 26-year-old humanitarian worker. She is believed to be the terrorist group’s last remaining United States hostage.